Select the "Order Code" for the type of insulation and gauge wire you need. Just Select the "Order Code" from the "Options" below with the type of insulation you need, then add the Length to the end of the order code. Price is listed to the right of the "Option" selected. Example: K-20-CFCF-25 Is type K-20-CFCF; 25 feet in length. Example: K-14-HGHG-1000 Is type K-14-HGHG; 1000 feet in length. 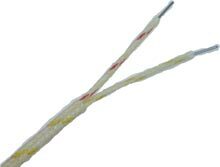 Above temperatures are insulation ratings and actual wire product rating may be lower due to conductor size. Note: Ceramic, Refrasil and Hi-Temp Fiberglas insulations are color-coded with tracers. High performance metal overbraid and armor may be applied over the above insulation to provide additional abrasion and mechanical resistance. 304 Stainless Steel, Inconel 600, Tinned Copper, Wrapped Spiral Armor. Please Select the "More" button at the bottom or "Click" on the "Product Specs" Icon at the top of the page. High Performance metal coverings can be added to most any wire product. Other constructions can also be provided at the buyers request. Please note that not all insulated wire variations are available on the web site. For those variations not listed above or not available on web site. Discounts are available for quantities of 3000 feet and above. Just Select the "Order Code" from the "Options" below with the type of insulation you need, then select the Length at the end of the order code. Price is listed to the right of the "Option" selected. Other high temperature constructions are available.